I guess I would consider myself to be a crafter - and a die hard one at that! 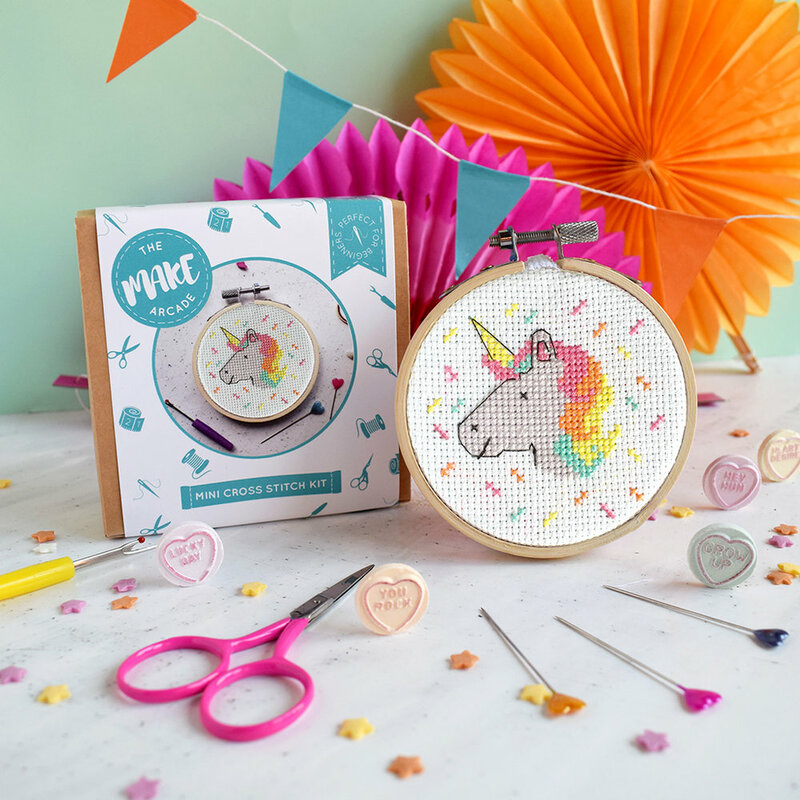 I am the designer and owner of The Make Arcade and we manufacturer quirky craft kits, ranging from cross stitch, sewing, embroidery and more. I also teach craft workshops and am a mum of two little boys! My typical day is jam packed! After the school run I cycle to my studio and start the day with coffee and emails/admin and checking supplies etc. Orders are printed off - we sell via our website, Etsy, Not on the High Street and QVC, and I check we have everything or make up additional stock. I pack up orders from midday and leave the studio at 2.45pm at the absolute latest to rush to school. I generally work most evenings of the week too, settling down to make samples or work on packaging with a box set on the sofa. Where do you work? What is your space like? What do you enjoy doing when you're not working? My studio is at the beautiful Fisherton Mill complex in Salisbury. We don't have a lot of spaces for small businesses in Salisbury that suit an arts/craft type business but where I am is amazing. There is a gallery, cafe and shop, and lots of studios all situated in a listed Victorian mill. It was a dream come true to get the space here and I have just moved to a larger, courtyard studio - its amazing! What do you consider to be the main challenges facing shop/gallery owners at the moment? Running a small business is a rollercoaster and there is lots of risk involved especially in the current financial climate. Making yourself visible online and on the high street is a full time job in itself! I think though that despite the threat from the economy there is always a need for 'just a card' whether it be an actual card or a small gift or 'pick me up' purchase. I have lots of ideas for The Make Arcade and have enjoyed watching it naturally grow in the past few years. I have quiet ambition and am very focused on the future, but try not to put too much pressure on unattainable targets - especially with the restraints of a young family. This year was about launching wholesale in the UK, next year its taking TMA international! Do you have any tips for fellow small business owners and designer/makers who are reading this and may be just starting out? My tips for starting a small business are persevere, don't give up and if you get a knock back take a break, have a walk/cuppa and come back to it later. Don't run before you can walk - you'll burn out if you take on do much, manage your workload. Believe in your ideas and designs - you know your products/business the best, this will give you the confidence to sell them and grow your business. It hadn't occurred to me the 'just a card' message would suitably apply to any small purchase in a gallery. Makes perfect sense to apply it to any small purchase! I will be applying the 'Just a Card' message to my storefronts and studio space and passing the details on to the gallery shop where my studio is located. Where did you hear about the campaign and which Social Media platforms do you use most frequently? I heard about the campaign in Mollie Makes magazine and it came up in my Twitter feed too. What do you think people can do to support Just A Card, and how will you be doing so? The local independent is so important on our high streets. The diversity that they offer is exciting and creative and great for local economy. If we can encourage and offer shoppers the opportunity to pop in and buy those special bits, instead of getting everything in one place, it would make a real impact. In my busiest months in the autumn and run up for Christmas I will be coaxing customers into my studio with fun stocking fillers and crafty essentials!